An attorney from the American Civil Liberties Union says that Facebook did the right thing when a Washington state law enforcement agency filed a search warrant against a local anti-Dakota Access Pipeline page. The Whatcom County Sheriff’s department last month filed a search warrant seeking messages, photos, and other private data from the Bellingham #NoDAPL Coalition Facebook page. The search is the likely result of an anti-pipeline protest that people in Bellingham, a town about 90 miles from Seattle, organized last month on the I-5 highway, ACLU attorney Brett Kaufman tells ConsumerAffairs. Organizers stopped traffic for about an hour, and while no arrests were made, law enforcement after-the-fact accused the group of indirectly causing a car crash. When Facebook was served with a search warrant last month, the site gave notice to the people who ran the Bellingham #NoDAPL page, allowing them enough time to seek ACLU’s help and challenge the warrant in court. An ACLU motion to stop the warrant is now pending. “We haven’t seen one of these before, targeting a group that’s engaged in political advocacy," Kaufman tells ConsumerAffairs. “Facebook did what we hoped any tech company would do with this request,” by warning the users, he adds. But technology companies like Facebook don’t always have the leeway or ability to inform people that their internet or computer activities are about to be searched. In other tech search warrant cases, law enforcement sometimes asks for an accompanying gag order, or an order that bars a company from warning its customers that they have been served with a warrant regarding their private data. “In many cases, either both on subpoenas or on warrants, the law enforcement can get a gag order the same time they get the legal process sorted out. That would prevent Facebook from notifying the user of what's going on,” Kaufman explains. Tech companies have been attempting to fight this practice. Last year, Microsoft filed a lawsuit against the feds arguing that such gag orders are unconstitutional, writing that the gag order "absolves the government of the obligation to give notice to a customer whose content it obtains by warrant, without regard to the circumstances of the particular case." 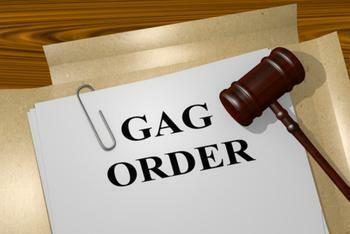 According to the suit, federal courts have issued more than 3,250 gag orders over a 20-month period. The case has been moving slowly, though last month a U.S. District court in Washington denied the feds’ motion to have the case tossed, allowing Microsoft to go forward with its suit. The ACLU is also supporting Microsoft in this case. “Movants American Civil Liberties Union and American Civil Liberties Union Foundation are customers of Microsoft who rely on Microsoft’s email and cloud-computing services to store and transmit sensitive communications and data,” the advocacy group’s attorneys write in a legal motion. “They seek to intervene in this suit to establish their constitutional right, as customers of Microsoft, to government notice of any search or seizure of their communications." Law enforcement have portrayed their search warrants and gag orders over user data as an inevitable aspect of doing their job. “Law enforcement is always going to be bumping up against privacy...I don’t think our statutes have yet caught up,” Manhattan District Attorney Cyrus R. Vance Jr. told Newsday last month. Vance’s office since 2013 has been investigating New York City police officers and firefighters who allegedly made false claims that they were too disabled to work after the September 11, 2011 terrorist attacks. Dozens of officers accused of fraudulently collecting disability have been indicted in that case already, and the alleged leader of the conspiracy has pleaded guilty, but the investigation continues. The Manhattan District Attorney has so far filed 381 warrants to search the Facebook pages of the suspects along with a gag order to prevent Facebook from giving users notice about the search, which Facebook is also fighting. Last month, Facebook said in court that the suspects, their families, and even the suspects’ sexual orientations are “all caught in a dragnet,” and that the gag order is unconstitutional.